This weekend was a weekend in many ways about finishing things that I left unresolved for years. 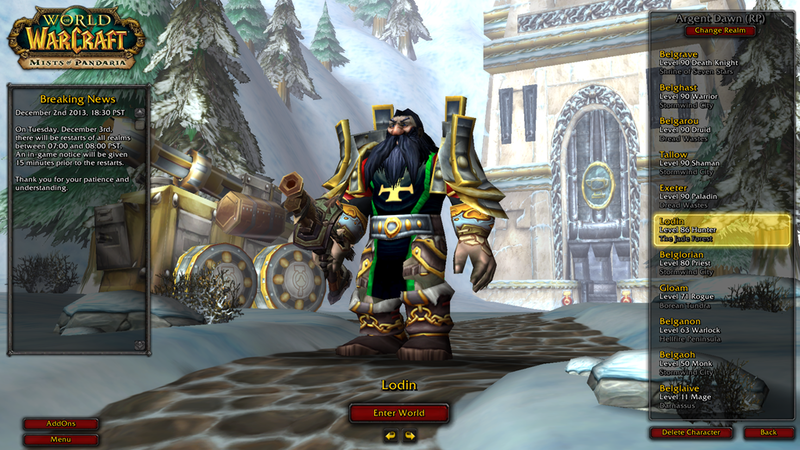 Over the course of the weekend I managed to get in several heroic runs of Legion content. During Vault of the Wardens… we wiped a lot. So much so that by the end of the run we were all showing yellow on our paper doll armor portraits. It was around this time that I saw some text that I dread “Does anyone have a Jeeves?”. This was quickly followed up by a statement from my friend Grace, “Hey Bel, You are an Engineer right?”. To which I have to hang my head in shame every time this conversation comes up, because I am a failure as an engineer. The biggest problem that I have had is the fact that my warrior is the completely screwball combination of Enchanter and Engineer. Its like I chose the two worst things to level and slapped them on the same character. The truth is… I used to be the even stranger profession for a warrior of tailor. When I created this character I had no bag makers, so I decided to remedy that problem. Then during Burning Crusade I could not get a helmet to drop period. I went through all of Tier 5 and almost all of Tier 6 still wearing my Tier 4 helmet. Over the course of a weekend I decided to fix that, dropped tailoring, and power leveled my engineer from zero to the then level cap… and crafted myself a t6 equivalent helm. The very next week… a helm dropped for me. Looking at the list now it seems even more like madness but I set forth to gather it up while we talked on the podcast. The first goal was Thorium ore, which I set forth to farming in Winterspring which I could get to easy enough through Hyjal. Remember I am not a miner on my actual engineer so instead for this job I grabbed Tallow my Jewelcrafting/Mining Shaman. This part went super quickly, and I decided to drop by Darkshore to pick up a few copper nodes to be done with the “Vanilla” section of the list. From there I took the Stormwind Mage’s Guild port to Hellfire Peninsula and farmed anything I happened across on my way to Zangarmarsh. I remember spending hours running/flying circles around Zangarmarsh farming Fel Iron and Adamantite… so I focused on this zone until I neared enough Fel Iron. From there I took the exit from Zangar to Nagrand and flew a path around that zone until I finally gathered the Adamantite I needed. I lucked out and found just enough Khorium while farming so I moved on to Northrend, where I flew circles around Grizzly Hills until I had gathered up enough Cobalt. Similarly to Zangarmarsh, I spent most of my Wrath farming time in Sholazar Basin so I quickly gathered up the requisite amount of Saronite I needed there. Lastly for Northrend was flying a bunch of circles around Icecrown trying to find Titanium. Here is the point where I cheat a little and tell you all that I had a handful of bars sitting in the bank left over from something so I didn’t really need that much to continue onwards. The challenge was getting enough elemental stuff to create the Eternals and the Primals. Before leaving Nagrand I slaughtered a bunch of fire elementals at the elemental plateau which gave me enough to create the two primal fires. While mining I got more than enough Earth and Shadow, which left me in a similar position needing fire. I made an attempt at Wintergrasp but Horde was currently holding it, which means the elementals there have a greatly reduced drop rate. This is the point at which I went to the wowhead and found that apparently there is a lesser known farm spot in Storm Peaks. There is a cave full of mobs called Wailing Winds that are nearly instant respawn and have a pretty decent drop rate for the fire. So after about fifteen minutes of killing them I managed to gather up the mats to do my Eternal Fire. This left one last component… the King’s Amber which I initially thought I would simply buy off the auction house. We had none available, and after looking at how I might actually get my hands on some… it seemed like it was going to be the part of this equation that killed me. I instead restored to trying to transmute them… which required 2 Autumn’s Glow that caused me to once again fly some more around Sholazar Basin and this time prospect it hoping for the gem I needed. I transferred the materials to my alchemist… and then was disappointed that apparently old world transmutes still incur the once a day timer. It was around this time when Thalen told me he would be re-upping his account and was certain that he probably had the needed gem sitting in a bank somewhere. We then played this game… of him trying to remember who was his jewelcrafter. Thalen has been gone from World of Warcraft since about halfway through Pandaria, meaning he has slept several times since then. When he finally landed on the right character, he didn’t have the gem… but instead said he could swap to his alchemist and do a transmute. So we played a similar game of trying to figure out which character was his alchemist. Finally we got the mats and I mailed everything to Belghast to start crafting the sub components. This is the point at which I realized that I apparently NEVER picked up the recipe for the original Repair Bot on this character from Blackrock Depths. Prior to Belghast I had another engineer, and I knew that I had grabbed it on that character, but I guess mentally I transposed that event to happening on my current engineer. I hopped on a mount and flew over to Blackrock Depths, ran in quickly… got the pattern and returned once more to the Dwarven Quarter in Stormwind where I finally combined everything into my shiny new Jeeves. I had enough mats left over to craft a Moll-E as well. It was a whirlwind of farming but during the three hours or so associated with the podcast and me doing post podcast editing I am now less of an engineering failure. For whatever reason this week has been significantly more difficult than most. I’ve been struggling with maintaining consciousness, and by that I mean it feels like I have just been dragging my way along through slowly drying concrete. I am not sure if this is still a side effect of letting me get completely out of my sleep schedule over the Thanksgiving break… or instead just that I slept horribly on Sunday night. It might also be that I seem to be fighting some cold like crap that just doesn’t seem to want to let go of me. Whatever the case, I’ve been tired enough to sleep at 8pm most nights, and generally finally give into its sirens call around 10pm. Since getting the new Kindle I end up reading for a bit until my eyes are too tired to keep propped open, and then finally I sleep. From everything I can tell I am sleeping extremely soundly because I when I finally wake up it feels like I’ve slept the entire night through. The only problem is I have been waking up 20-30 minutes ahead of the alarm clock. I know I should just get on up… but its cold out in the real world and the bed is so comfy. I keep thinking at some point I will have repaid whatever sleep debt I have built up, but then again… I’ve never slept the supposedly needed 8 hours a night. Maybe I have decades worth of lost sleep waiting to be repaid and it is finally catching up with me. Whatever the case, I am struggling… which means that when I am actually online I tend to be wandering around aimlessly. Over the last several nights I have missed message after message in game by friends, and I always feel horrible when it happens. Sometimes it is simply the scroll of combat, other times I am alt tabbed out looking at something else. In any case right now in this current daze I am struggling to keep moving forward, let alone be functional when it comes to interacting with others. I seriously feel like I could take the day off… and sleep literally all day right now. Unfortunately I am not sure if that would do me a world of good… or simply make this whole situation worse. Last night one of my friends commented that I was probably heading for a burnout by trying to raid on both Horde and Alliance… and there is at least part of me that absolutely believes her. While I intend on making the Wednesday night raid tonight, I know at some point there is going to be a place where I simply cannot make both raids each week. In truth I have been feeling the desire and need to go off and level something new, instead of doing nothing but level capped content. 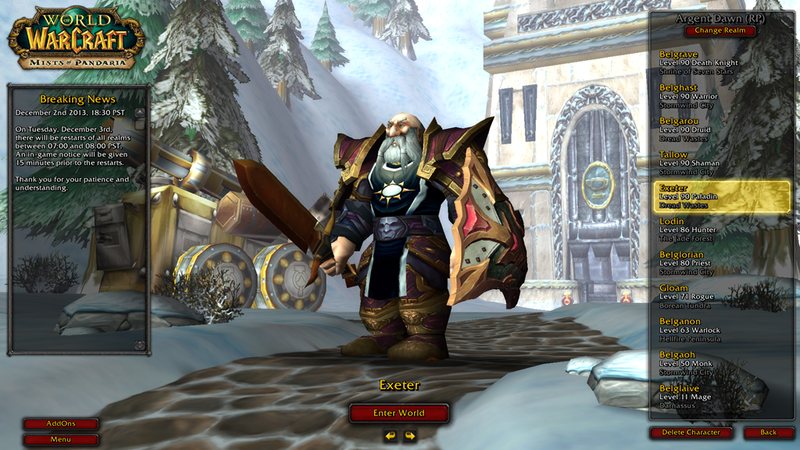 Right now however it seems like all I have time for is to attempt running LFR on Belghast and Belgrace… and that simply doesn’t leave much time left for the rest of the activities. At least on Belghast I managed to pick up a 695 warforged baleful weapon, which gives me something decent to move forward with. On the cow I have a 690 two hander that has been valor upgraded twice, so once again a completely viable weapon. There are technically slots where LFR gear would potentially be an upgrade, but I am starting to question the logic of running it just for those handful of potential upgrades. I need to run Highmaul on the Cow for abbrogator stones, and Hellfire on Belghast for tomes… but past that I think I am going to cut out the rest of the LFR unless I am literally gearing a new character. Looking for Raid is cool in the aspect of being on demand raiding with zero commitment. The problem being… it always feels like slamming your face against a wall even when it goes smoothly. Highmaul was really fun to LFR because it went so quickly, and you could pretty much ignore all of the mechanics. Hellfire however… the bosses just feel like drudgery when doing it with a group of randoms. Don’t get me wrong I love the feel of that place when I am running with players that are going to do the things they need to do to make it through the fights. But both Hellfire and Blackrock are both “real enough” to make them frustrating when folks are attempting to faceroll them. I seriously have yet to get a group that has a shot in hell of doing Archimonde. Generally speaking I get grouped into a raid that has already failed a few times… as a replacement, and we then wipe five or six times… and ultimately end up leaving because over half the raid abandons ship. I really think that the perfect LFR fight takes no longer than five minutes to kill, because that seems to be the absolute upperbound of PUG attention. I noticed this morning that the Burning Crusade era Timewalking event has started, and I have to say… I am kinda amped. Granted I would have rather they simply made Timewalking a permanent part of the game, but I left the game before it actually went in. So I am hoping to be able to do several of the dungeons to get the feel of how they work. I have a whole bunch of nostalgia about the Burning Crusade dungeon running experience, and the thought of getting modern versions of the items I used to love… seems pretty awesome. Then again at the 675 ilevel cap… the items will pretty much just go in the transmog bin. I am not sure which side of the fence I will focus on, but whatever the case I just want to see some of the dungeons. Similarly I really want to experience the Mythic dungeon content, but in order to do that I really want to find a group to go in with. That does not seem like something that would be fun in any fashion to pug. Mostly… I am hoping I get over whatever thing I am going through, and can remain awake enough to function at a high level in content. Today already seems like a pretty sleepy day… so I am not holding out much hope. I guess my general answer is to feed myself enough caffeine until I begin to function appropriately.